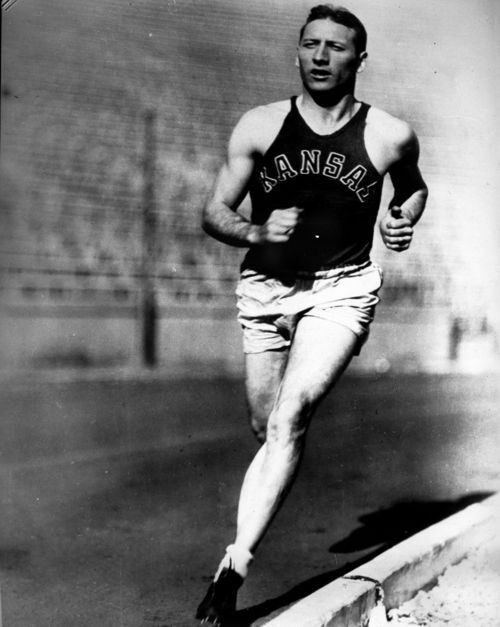 Glenn V. Cunningham, 1909-1988, one of the premiere milers in the 1930s, is shown running as a member of the University of Kansas track team. Born in Atlanta, Kansas, seven year old Cunningham and his thirteen year old brother, Floyd, received severe burns in a schoolhouse fire in 1917. Floyd died of his injuries two weeks later. Although Glenn's physician said he would never walk again, with rehabilitation and personal determination he recovered to become one of the nation's greatest milers. Between 1932 and 1934, Glenn won the Big Six indoor track titles and participated in the 1932 and 1936 Olympics. In 1938, Cunningham became the world's fastest miler as he set a new indoor record at Dartmouth College. In 1978, he was named the outstanding track performer in the 100-year history of Madison Square Garden, and, in 1979, he was inducted into the National Track and Field Hall of Fame.